In the previous post we managed to play sound on the Zybo Board. In this post we will focus again to develop cassette interface been driven by a .TAP file stored in main memory. Once developed, we will test this interface by playing the output of this interface to speakers. We start off by having a .TAP file stored in the SDRAM of the ZYBO board. The contents of this file gets transferred word by word via the AXI protocol to our FPGA logic. You might recall from previous posts that whenever we access SDRAM via AXI, we are are making use of two modules that we have developed earlier on. The first module we use to connect to one of the AXI ports of the ZYNQ processor. In this block we also make use of an AXI Burst block which is an IP provided by Xilinx. The AXI Burst basically abstract the technical details of the AXI protocol and provide us with a set of signals that is easier to work with. The second module we take the simplified set of signals provided by the AXI Burst Block and store the stream of datawords within a FIFO. The FIFO basically buffer the information received from the AXI port and absorb the bursty nature of the AXI protocol. Thus, on the receiving end the FIFO you will get the datawords at a constant rate. You will also recall from previous posts that previous mentioned FIFO should have sufficient depth to avoid underflow. In our cassette interface, however, it is sufficient to store only a single word at a time making a FIFO a bit of a overkill. Why don't we need a FIFO for the cassette interface? That is because we are receiving data words on the AXI bus at 100MHz whereas we will be producing a pulsating data signal with a maximum frequency of about 3KHz. That means that between toggling pulses we will have more than enough time to fetch the next sample from SDRAM. Let us now refer back to our high level block diagram. Our block used for storing a word of AXI data at a time is the READ WORD block. We receive data from AXI 32 bits a time, whereas with .TAP file data it is easier for us to inspect data a byte at a time. It is for this reason that we have implemented a BIT SLICER block, that breaks up a word into its individual bytes. This functionality is implemented with a shift register shifting eight bits at a time. You will see that apart from the data signal between the READ WORD and BIT SLICER block, we have two extra signals: Valid and ACK. This is a pattern you will see quite often in an pipeline architecture. When the READ WORD block have received a piece of data fro the AXI port, it informs the Byte Slicer by asserting the Valid line. With assertion of this line the Byte stores the data and asserts the ACK line. This in turns informs the READ WORD block that it can go ahead and retrieve the next word from the AXI port. In this way both the READ WORD and BYTE SLICER is kept busy. This almost remind us of a assembly line in a factory. One more thing I want to highlight between the READ WORD and BYTE SLICER is the dotted line with the caption Cross Clock Domain. This is to highlight that on the left side of the dotted line we are working at the AXI clock frequency of 100MHZ. on the right hand side we are working at only 1MHZ. To cater for these different clocks, we will again use milti-flop synchronisers in both blocks. Next, let us have a look at the Sample Assembler block. If you read through the specification for a .TAP file you will see that each pulse width value will be one byte or four bytes. The rule is simple: If the byte value is zero, the next three bytes will give the absolute pulse width in microseconds. If the byte value is non-zero, the pulse with is contained only within a single byte. It it thus the purpose of the Sample Assembler to determine the duration of the next pulse width with the stream of incoming bytes. Our final block is the PWM block, which a lot of you will recognise as the acronym for Pulse Width Modulation. PWM actually describes the data signal you receive from a Commodore Datasette: A set of pulses of varying length. Our PWM block is basically implemented as a countdown timer, toggling its output each time when a underflow condition has occurred. You will also see that the output of the PWM block is fed back to the the Sample assembler. The Sample assembler uses the pulse transition to a low as a cue to start assembling the next sample pulse duration. Let us have a look at the code for the READ WORD block. Firstly this code contains some glue logic for interfacing with the AXI Burst block. There is also some reset logic and restart logic. Restart logic is important if you reload SDRAM with a new .TAP file. We will be receiving the ACK signal from the Byte Slicer, which is another clock domain. For this reason we are defining three synchroniser flip-flops sync_ack_0, sync_ack_1 and sync_ack_2. We are also using these flip-flops to determine the positive edge of the ACK signal, which we use to trigger the loading of the next word from the AXI port. In this module we have again the scenario where we receive a signal from another clock domain, which in this case is data_valid. For this reason we are creating creating the synchronisers data_valid_0 and data_valid_1. As mentioned earlier on, the bit slicer is shift register shifting eight bits at a time. In our implementation, the shift happens while the read line is asserted, which will be driven by the sample assembler when it needs more bytes. The Sample Assembler starts off by inspecting the first byte that comes in. If it is non-zero, it gets padded with three zeros and we have a sample value. If the first byte is a zero, the Sample Assembler waits patiently for the next three bytes to be clocked in to get the full sample value. Once a sample value is created, we wait for a negative clock transition from the PWM to restart the process. As mentioned this is just a countdown timer of which toggles the output on underflow. You will also realise that when storing the timer val in the load register we discard the lower bit. This is because the timer values in a .TAP file is the period between two positive transitions. So, we need to toggle the pulse at a period of half this value. With all the modules created it is a matter of linking everything up. A port that need special mention is the restart port you get on most of these modules. This port needs to be assigned to a AXI slave port so the ZYNQ processor can access it. You can then toggle this bit programatically when you have loaded a .TAP file into SDRAM. A .TAP file can be loaded into SDRAM by making use of the XSCT command mwr (memory write). With all the modules linked up you can test the design by integrating with the sound system we developed in the previous post. The produced sound should sound similar as when you play a C64 Tape on a Tape deck. In this post we have developed the cassette interface that will take a .TAP file and produce a corresponding signal of variable pulse widths. In the next post we will start to integrate this cassette interface to our C64 module. In the previous post we start going down the alley of Tape Emulation and ended off writing some Python code for converting a .TAP file to sound. The sound that we generate is basically a set of pulses of varying widths. Outputting this pulse widths as sound is a quick sanity check if we implemented tape emulation more or less correctly. Our next goal is to see if we can implement this sound generation from a .TAP file in real time within the Zybo boards FPGA. Playing the generated sound on the Zybo is perhaps the most complex part of the exercise, so I have decided to dedicate this post to Zybo sound generation. These ports are all hooked up to a Audio Codec chip from Analogue devices: The SSM2603. This Audio Codec have two ports that hooks up to the ZYNQ SoC: an I2C port and an I2S port. The I2C port is used to configure the Audio Codec like sample rate and volume control. The I2S port is used to transmit digital audio data between the ZYNQ and Audio Codec. Both the I2S port and I2C port is linked to pins on the ZYNQ of which only the FPGA has access to. As mentioned in the previous section, configuation of the audio codec is done via a I2C port. 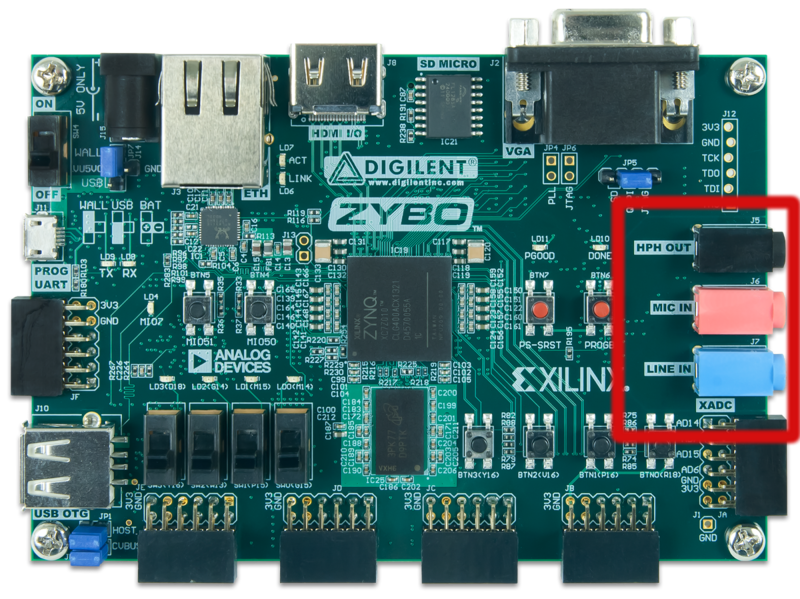 Implementing a I2C port in an FPGA can be a daunting task, and one will be pleased to learn that the Zynq have two I2C onchip peripherials. Shortly after discovering this, one might feel someone burst your bubble by discovering that the I2C port of the Audio codec is hooked up to pins that onchip peripherals don't have direct access to. But fear not! 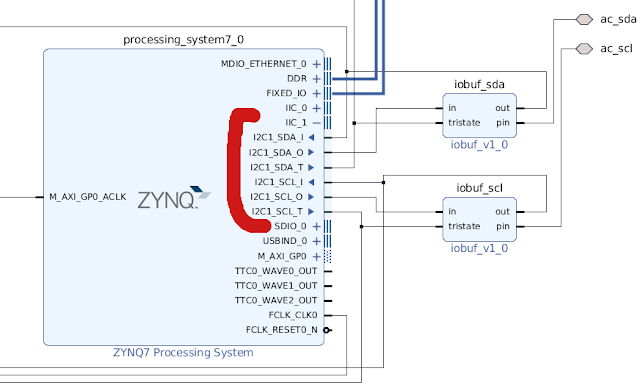 The Zynq allows you to configure the ports of onchip peripherals to be redirected via EMIO. This basically means that you can make these ports available to the FPGA. Within the FPGA you can then either decide to hook up these ports directly to the output pins or you can join hook the ports to custom logic blocks. I have marked in red the ports of an onchip peripheral that I have exposed to the FPGA. These ports I have hooked up to two instances of a custom logic block iobuf. This logic block is basically an implementation of a tristate buffer. I have added a bit of comments on what is going on during initialisation, but I am not going to go into too much detail here. More details is provided in the Zynq Technical reference manual in Chapter 20: I2C Controller as well as Appendix B, in the register details for the I2C controller. 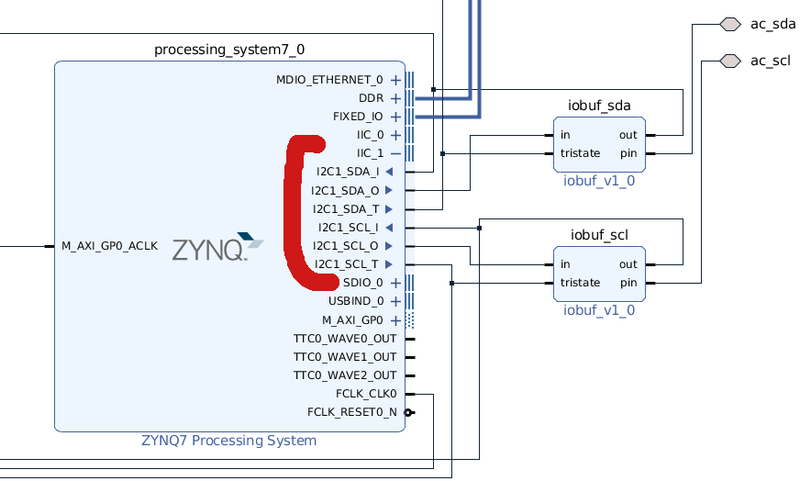 Again, here is lot of things going on here and can be best understood with the Zynq Technical Reference Manual. Here it is also handy to have the Datasheet for the SSM2603 Audio Codec available to understand the format required for setting and reading registers. Let me give a quick run down what is happening here. The first write to register 15 forces the Audio Codec to write default values to all registers. The write to register 6 powers up all blocks within the Audio Codec accept the Out Block. According to the datasheet we can only enable the out block later in the initialisation process. The writes to registers 2 and 3 sets the volume of the left and right DAC. Next, let us skip straight to the write to register 7. This write informs the format of the samples that will be presented to the I2S bus, which in this case is 16 bit samples that is left justified. With the write to register 8 we are setting the actual sample rate, which is 48KHz. With the write to register 9 we are enabling the digital core. Note that it is preceeded by a small delay. According to the datasheet a short delay should be allowed after all blocks are powered up. With the write to register 6 we are finally powering up the Out block and with the write to register 4 we are enabling the DAC. You will also see that between the write to register 6 and the write to register 4 I have also added as small delay. Nowhere in the datasheet it is specified that it is necessary to do this. However, with trail and error i have found that if you do not add this delay you can do whatever you want, you will not get any sound output to the speaker. This concludes the configuration of the Audio Codec. In the next section we will discuss how to implement the I2S interface. To implement a I2S interface is much simpler than a I2C interface. Within the datasheet you will see other timing diagrams for other Input modes, but we will only be focusing on Left-Justified mode. A signal not present in the above diagram is MCLK (e.g. Master Clock) which is 256 times the sampling rate. Back to the diagram. The first waveform (RECLRC/PBLRC), indicates for which channel the current sample is applicable for. The BCLK generates a pulse for each bit of data. In our case where we have 16 bits per channel, the frequency will be 32 times the sample rate. Lastly we have the signal RECDAT/PBDAT that is the actual sample data. All three signals together with MCLK should all be in sync to avoid data corruption. We will see in a moment how this is done. Now let us calculate the frequencies for the different clocks. As mentioned earlier on MCLK is 256 times the sample rate. Thus MLCK should be 12.288MHz. BCLK is 32 times the sample rate and therefore is the frequency 1.536MHz. .DDR_CLK_EDGE("OPPOSITE_EDGE"), // "OPPOSITE_EDGE" or "SAME_EDGE"
.SRTYPE("SYNC") // Set/Reset type: "SYNC" or "ASYNC"
We pass the generated clock to clk_in. The output port Mlck_O is the signal we should assign to an output pin. For the input port clk we pass the generated 12.288MHz signal. clk_1_5_mhz is our generated bclk signal. channel_enable is the channel indicator and out_data the actual sample data. So, the bclk clock is generated from the MCLK by means of a clock divider. As you can see, we have implemented a shift register for shifting out the sample values, which we reload each time the channel indicator signal toggles. In this post we played around with sound on the Zybo board and managed to generate a monotone. This exercise will aid us in the next post to create a cassette interface and verify the design by listening to the produced pulses. This post will also come in handy in future posts where we implement SID emulation. In the previous post we managed to interface our C64 FPGA module with a USB keyboard. In this post we will start to focus on tape integration to our C64 module. Well, not exactly interfacing with a 1530 Datassette, but simulating the tape loading process from a .TAP file. While pondering in this alley, we might just relive the nostalgia a couple of decades ago where we all played a C64 cassette on a normal sound system to hear what it sounds like. For this exercise we will see if we can take a .TAP file and see if we can reproduce similar sounds, with the help of Python on a PC. Once we have successfully reproduced the sound of a C64 tape, we will set forth and see if we can do the same on the Zybo board, with the logic implemented within the FPGA. I will not be covering all the above mentioned in this post, but rather in several ones, working incrementally towards a solution where we have a fully integrated tape to C64 module solution. 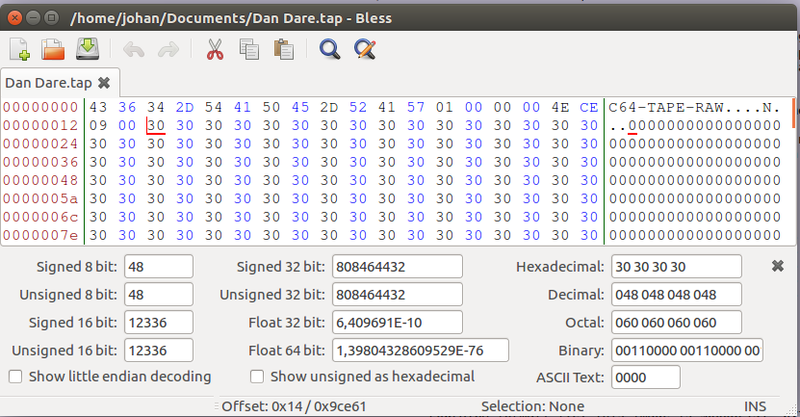 The file header starts with a textual description C64-TAPE-RAW. The actual file data starts at offset 0x14. The file data basically a set of pulse widths. In general a pulse width is represented by one byte. Multiply this value by 8, and you have the pulse width in terms of 1MHz pulses. Let us have a look at our example snippet. Starting at offset 0x14, we see a series of 30's. Converting this number to decimal and multiplying by 8, we get 384. This gives us a period of 0.000384s. From this period we can calculate the frequency from the equation f = 1/T. This gives us a frequency of 2604Hz. This is the monotone you hear for the first 10 seconds or so from a C64 tape. With the information from the previous section, let us see if we can take a .TAP file and and generate the sound as we remember it a couple of decades ago. For this exercise we will be using Python to generate the raw samples. Not many programs can play raw samples, but Audacity can play it. timei is the current time in millionths of a second. I will show in a moment how this variable gets updated. This loop will generate 4 minutes worth of sound samples. So, in this part we cater for both the zero byte time values and for other case. I took the samples and converted it to a mp3 with the help of Audacity. Unfortunately, since I use Blogger for hosting my posts, there is not a easy way to embed sound clips within posts. So I had to create a video from the mp3 and upload it to Youtube so everyone can listen to the end result. It sounds more or less as I remember it when I listened a couple of decades ago on a tape deck to C64 tape. Perhaps the leading mono-tone sounds too pure compared to the tape player of the day. In this post we have started to investigate how to integrate tape loading functionality to our C64 module. As a nostalgic exercise, we attempted to reproduce the sound of a .TAP file as we remember it long time ago. I performed this exercise on a PC with Python and Audacity. It would be interesting to see if this exercise can be performed on a Zybo board, taking the .TAP file and generating the sound samples in real time within the FPGA and outputting the sound to a speaker, via the Line Out on the Zybo board. My goal of generating sound from the .TAP file on a Zybo board perhaps sounds a bit over the top and unnecessary, but it can be an opportunity to learn how to use sound on the Zybo board. This knowledge be valuable if we later decide to also incorporate a SID within our C64 module. So, in the next post we will attempt to generate sound on the Zybo board.